Linea de Fuego (http://lineadefuego.org/) holds USPSA matches on the 2nd and 4th Saturdays of the month at the Pala range (http://www.ncsapala.com/). New shooters are encouraged to shoot with the club, the Linea de Fuego website provides details on required equipment and what to expect. The club also runs a 3-gun match at the Pala Range, on the 2nd Sunday of the month, and once a quarter an all steel USPSA rules match. Signup for all matches begins at 8:30AM and the range goes hot at 9:00AM, the match fee for non-members is $30. Google Maps. Please verify dates and times with the hosting club. 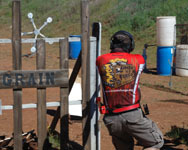 San Diego Tactical Shooters (http://www.sandiegotacticalshooters.com/) holds two IDPA matches a month. Matches are held on the 2nd and 4th Saturdays of the month at the Pala Range (Google Maps), 8:30AM sign-up, 9:00AM shoot. All venues are out-doors. Please verify dates and times with the hosting club. Please note that the Escondido Fish & Game match on the 4th Saturday of the month is no longer being held and has been replaced by a match at the Pala range on the same date (4th Saturday). Prado IDPA (http://ca-idpa-shooters.com/) holds two IDPA matches a month at the Prado Olympic Shooting Park. 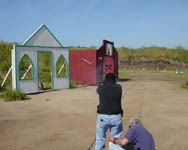 Matches are held on the 1st and 3rd Saturdays of the month, new shooters meeting is at 8:00AM, matches start at 8:30AM. Fees are $20 for IDPA members, $25 for non-members. Prado IDPA also holds an IDPA Classifier match three or four times a year. 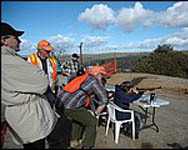 They will be hosting the 2008 California State IDPA Championship. Please verify dates and times with the hosting club. 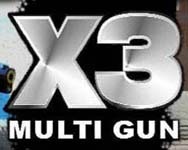 X3 Multigun (http://www.x3multigun.com/) Monthly 3-gun matches, put on by Sam Houston, hosted by Unique Gun Club and The Deadwood Boys at Wes Thompson’s Rifle Range in Piru, on the old Southwest Pistol League ranges. We are 20 minutes northwest of Magic Mountain, off Highway 126, between the town of Piru and Lake Piru. Entry fee is $40 for 6 stages. Sign up at 0830, shoot at 0900. Tactical and Open divisions. USPSA rules and "time-plus" scoring (no major/minor power factor effect on scores). Please verify dates and times with the hosting club. 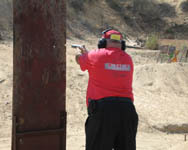 Running Gun IPSC (http://nrg.jvdynamics.com/nrg) holds a match every Saturday in Norco, CA. 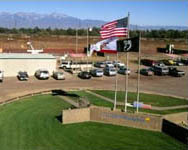 The Raahagues range in Norco is located at the corner of Hellman and Old River Road in the city of Norco. IPSC experience is not required. 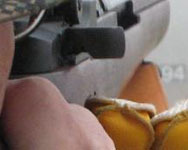 Bring your favorite gun, 250 rounds of ammo, a strong-side hip holster and be at the range at 8:30am. Be prepared to have a great time, it's 100% pure fun! Match starts at 8:30AM and the match fee is typically around $30, contact the club for more info. Please verify dates and times with the hosting club. Lemon Grove Rod and Gun Club (http://www.lemongrovegunclub.com/) runs a large range of monthly matches including a pistol fun shoot, sporting clays, five stand, cowboy action, rim fire matches, a Friday night pot shoot, and on months with a 5th Sunday a Tactical Shotgun match. Lots of other events and prices, well worth checking out their website. The range is located in east county, south of Alpine Google Maps. Please verify dates and times with the hosting club. Rainbow Range (http://www.recessesofmymind.com/shooting/rainbowrange.html) holds a combat steel match on the second Saturday of every month at their range in Rainbow, California. The match includes five six shot stages, with two optional rifle stages and two optional shotgun stages. Following the regular match are two- and four-man relays and a Walk and Draw. Match starts at 9:00AM and the match fee is $6 plus a dollar each for the optional stages, contact the club for more info. Please verify dates and times with the hosting club. The Shooting Sports Alliance (http://ssashooter.com/) holds a Steel Madness match on the first, third, and fifth Sunday of the month in Norco, CA. A typical match will consist of 6 stages or scenarios. Each stage averages about 25-40 pieces of steel with about 200 targets or so total. Bring plenty of ammunition. Targets vary in size from 18" x 24" rectangles to 5" round plates shot at distances ranging from 7 to 40 yards. Match starts at 9:00AM and the match fee is $35, contact the club for more info. Please verify dates and times with the hosting club. Santa Margarita Gun Club (http://www.santamargaritagunclub.org/) sponsors programs to promote High Power Rifle and Pistol competition, as well as training focused on Junior shooters. Matches/Practices take place at the Wilcox Range Complex (Range 103), Marine Corps Base Camp Pendleton, CA. Their practice matches are open to all and are held almost every month. Please verify dates and times with the hosting club. 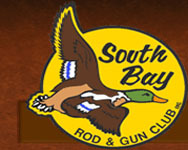 South Bay Rod and Gun Club (http://www.sbrgc.org/) has four shooting ranges that are supervised by at least one Range Safety Officer and offer day use rates as well as annual memberships. 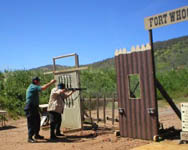 They host a wide range of monthly rifle and pistol matches including CMP rifle matches, palma, silhouette, cowboy action, and muzzleloaders. Please verify dates and times with the hosting club. Match directories should email webmaster@oceansidepistol.com to have your match added to the list.